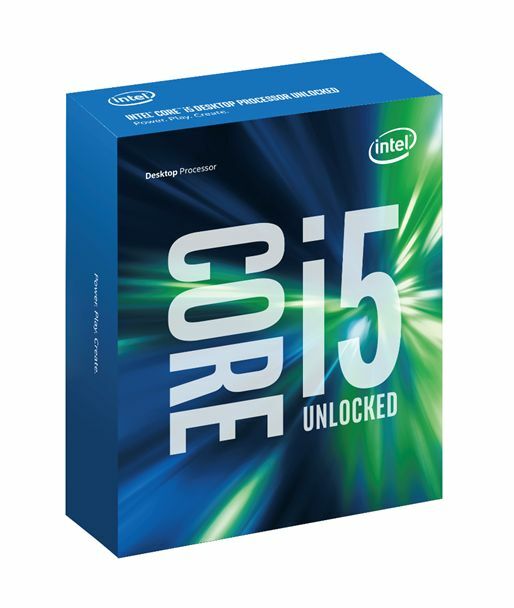 The Intel Core i5-6600K is a high-end quad-core desktop processor based on the Skylake architecture, which was announced in August 2015. The CPU, which is manufactured in a 14 nm process, runs at 3.5 up to 3.9 GHz (2 cores: 3.8 GHz, 3 cores: 3.7 GHz, 4 cores: 3.6 GHz) and – contrary to the i7-series – does not support Hyperthreading. Being a so called "K"-model, the Core i5-6600K has a free multiplier and can be easily overclocked. Because of the slightly slower clocks, the smaller L3-cache (6 instead of 8 MB) as well as the missing Hyperthreading support, the Core i5-6600K is about 10-30 percent slower than the top model i7-6700K. The CPU will still handle demanding applications and games without any problems. Graphics are handled by the integrated Intel HD Graphics 530 with 24 EUs (Execution Units), which is clocked at 350 - 1150 MHz. Compared to the HD Graphics 4600 (Haswell, 20 EUs), the performance is increased by around 25 percent. The overall GPU performance is still low-end, so modern games can, if at all, only be played smoothly with low settings. The TDP was slightly raised from 88 to 91 Watts compared to the predecessor.